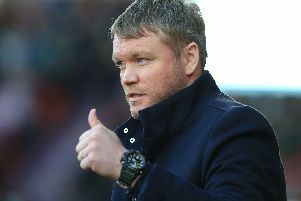 If Grant McCann’s phone did ring yesterday, anyone enquiring about his players would have been given short shrift. So said Doncaster Rovers’ boss at his pre-match press call; Rovers are determined to make this season into a special one. Star striker John Marquis, the subject of failed bids by Aberdeen and Peterborough United this summer, was the most obvious target for any last minute shoppers. But, as the transfer window closed without any further incomings or outgoings at the Keepmoat Stadium, McCann declared himself happy with the squad at his disposal and confident they can make their mark on League One. “No one’s going anywhere and we can look forward to the season ahead,” McCann, whose side host Wycombe Wanderers tomorrow, told the local media yesterday. “I’m really really pleased that the chairman and the board and Gavin [Baldwin] have all backed me on that. “We want to try and do something here this year. “We want to keep all our best players with us. “I’ve only been here six weeks so I’m still learning about the group and they’re still learning about me. Despite new signing Ali Crawford’s knee injury, McCann enjoyed a ‘chilled’ deadline day and has not ruled out replacing the midfielder in the loan or free agent market. “We could possibly still add someone,” he said. “But if I look in that position I’ve got Matty Blair, Issam Ben Khemis, Herbie Kane, Luke McCullough, Ben Whiteman, Tommy Rowe. Alfie Beestin. “I’ve got a lot of options in there. “If someone becomes available who is better than what we’ve got then we may look to do something but there’s no rush. “We’ve always got targets. I wouldn’t be doing my job properly if we didn’t. “I’m quite pleased with the squad. “I think we’ve got good numbers. I’ve just reeled off the midfield players and I’ve got six or seven forwards fighting for positions, I’ve got competition in the full back areas, two very good goalkeepers, three very good centre halves. While Rovers look to follow up their opening day win at Southend United, newly-promoted Wycombe will arrive at the Keepmoat aiming to build on their opening day draw with Blackpool. “They’re a very strong team,” said McCann. “Gareth’s [Ainsworth] done an outstanding job to move them into League One with very limited resources. “They’ve got threats all over the pitch. “We’ve got to make sure we nullify them and make sure our threats hurt them.